Wabash 2-6-0 Mogul #573 at the Museum of Transportation in St. Louis, Missouri. This locomotive recently underwent a cosmetic restoration and is finally back on display. 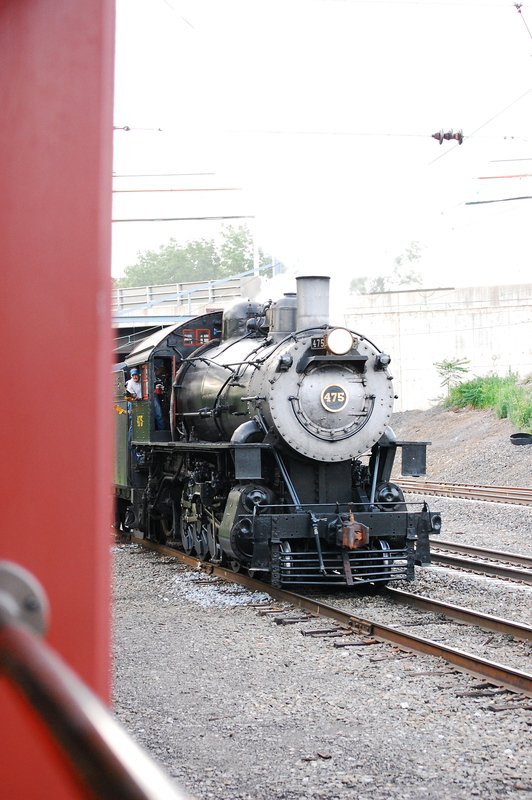 My visit to the Strasburg Railroad. My time at the Strasburg Railroad, which still runs under it’s original charter dating from 1832, was one the greatest railroading experiences that I will ever have. The atmosphere of being in Amish farmland was very enjoyable, as was the weather. It was enhanced with an old station to buy your tickets from and a 12” gauge children’s railroad around the station’s complex. Before our departure, my family and I were able to stroll around and look at the engine that was to pull our train, former Norfolk and Western 4-8-0 #475, and some of the buildings. Upon departure, we got into our car and found our seats. For the choice of cars, I would recommend the open-air car, which made the ride way more enjoyable with nice fresh air and the sights of beautiful countryside without having to look through a window. Just after we left the station we saw a motel where, instead of renting a room, you rent a caboose. There are some railroad crossings along the short 5 mile trip, and they provide the chance to hear that great steam whistle. After one of the crossings, this one being at Cherry Hill, there is a passing siding along the line past at Groff’s Grove, where, when the railroad is running two trains at once, the trains meet. Sadly, when I was there it was just the one train running, and we didn’t get to see a meet. After that the last place of importance we got to was Lehman Place ( a.k.a. Paradise, Pennsylvania), the end of the line. At Lehman Place, the railroad has a runaround track so the engine can pull chimney first back to Strasburg, after pulling tender first to Lehman Place. The Strasburg Railroad interchanges with Amtrak’s former Pennsylvania Railroad Harrisburg line at Lehman Place and, during my visit, an electric Amtrak train went by at such a high speed that if I had blinked I would have missed it. The runaround complete, we started the short trip back to Strasburg. I went back to the complex the next day to railfan a bit and to get a t-shirt of the railroad after stopping at the Railroad Museum of Pennsylvania (see earlier post). There was very friendly service at the railroad, and I would highly recommend anyone in the area to pay a visit to the Strasburg Railroad, one of the oldest operating railroads in the whole world. I think it was watching us. The hotel with the cabooses. Cherry Hill. No comment on the population.